AdRem iTools is a networking toolset combining Ping, Traceroute, DNS Lookup, SNMP viewer, port/network/bandwidth scanner, and more. The tools' output can be saved to a file (text, XML, HMTL, or Excel), while Ping or Traceroute tests can be graphed. 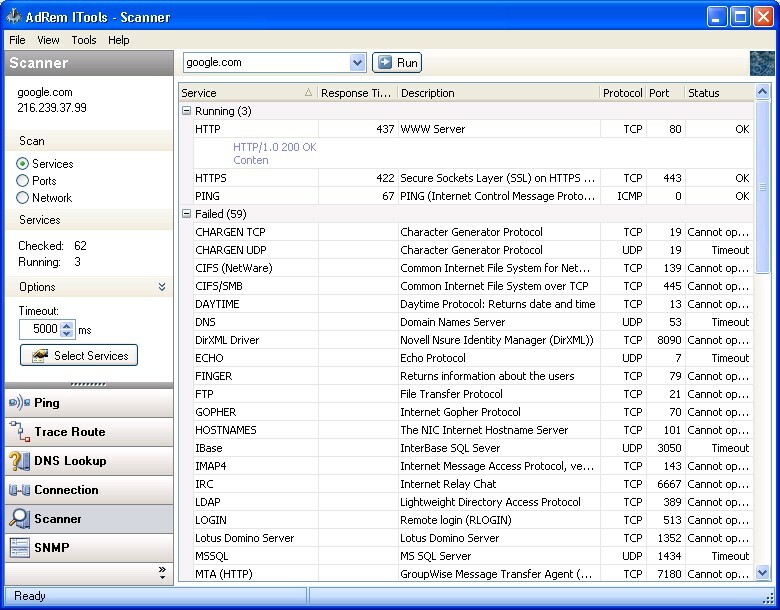 AdRem iTools 2007 is an essential networking toolset that combines diagnostic utilities such as Ping, Traceroute, DNS Lookup, SNMP viewer, port/network, bandwidth scanner, and more. All of them are available from a windows-driven interface, and their output can be saved to a file (text, XML, HMTL, or Excel). In addition, users can benefit from graphing capabilities in Ping or Traceroute tasks, share entered IP addresses/hostnames between utilities, and create desktop shortcuts to hosts and tools.